THREE quarters of public liability claims are accounted for by slips or falls and legislation is placing a greater onus on business owners and operators to provide safe environments for staff and visitors. Effective treatment of floor surfaces is cheap insurance. Expensive, aesthetically motivated floor choices are often abandoned in favour of a surface that does not transform into an ice-skating rink when wet. 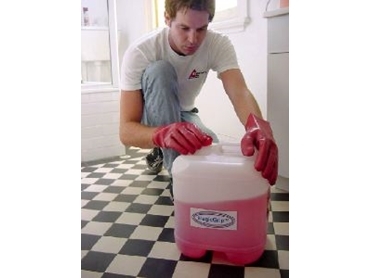 MagicGrip by Century Floor Safety provides an alternative by making existing floors safe. It is also one of the few products on the market that gives the necessary grip while remaining invisible to the naked eye. When applied to slippery tiled or concrete surfaces the formula reacts with the surface, changing it at microscopic level to give it permanent grip. This process is particularly effective when the surface becomes wet, creating suction between the sole of the shoe and the floor. When complete the treatment is undetectable even on close inspection. MagicGrip can be used on all types of slippery surfaces, including glazed and un-glazed ceramic tiles, granite, limestone, marble, terracotta, pebble-wash, terrazzo and concrete. Different surfaces require different application times and Century Floor Safety's floor technicians are trained to achieve the best results for specific floors. Once MagicGrip is applied, floor surfaces are maintained as usual but by ensuring surfaces are kept free from grime and oil, MagicGrip’s effectiveness is maximised.